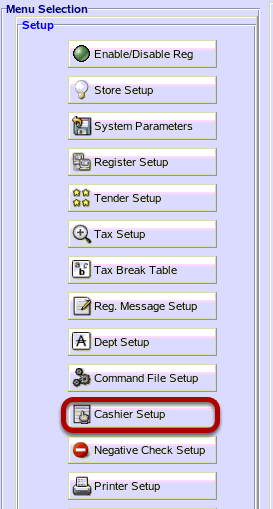 TravStar1 Point Of Sale SystemManager's Work Station Getting StartedHow Do I Edit an Existing Cashier? How Do I Edit an Existing Cashier? 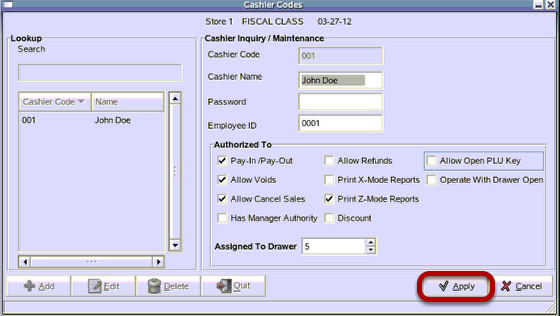 This lesson will teach you how to edit and existing cashier. From the setup menu, click on the "Cashier Setup" button. 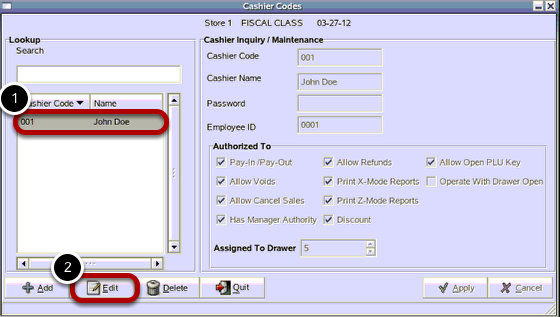 (1) Select cashier to edit, by clicking on the cashier's name in the cashier lookup menu. Make changes to cashier. If making a change to the cashier's password, remember the password is 4 numbers. For a definition of Authorized To options please see What Are Cashier Permissions. Then hit the "Apply" button. Prev: How Do I Setup a Cashier? Next: How Do I Setup an Employee?